I have always believed that our Father God sends us guardian angels to protect us. My prayers are with the drivers who I see on cell phones texting, to keep them alert and safe; for those in front, behind, and next to them. This has always been my prayer for my family and neighbors; for those on motorbikes, semi-trucks, school buses, the elderly, etc. God knows our prayers even before we ask. 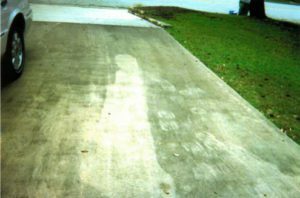 About a month ago I noticed this image in my driveway, but did not think anything of it until it rained, and then there was an angel by my car!! With the angel facing my car, I knew then that God was answering my prayers. I feel so humbled and blessed that God does answer prayers. God is good all the time, and we need to pray and give thanks for the good and the bad; even the tribulations bring us closer to Him. Might you be blessed and remember during this season of Lent.